Sugar ¼ kg or as per your taste. Boil the milk. Once it is well boiled, reduce the flame and slowly add the lime juice till the milk starts curdling. Stir the milk slowly till the milk curdles completely. Switch off the gas and pour the curdled milk (chenna) on a muslin cloth. Pour the ice water over the chenna in the muslin cloth and wash well so that the sourness due to the vinegar will go away. Drain out all the water and hang the cloth at least for 20 min so that all the water is removed. Now your chenna is ready. Knead the chenna gently. Do not knead it hard. Make small balls of chenna. It should be smooth and there shouldn’t be any cracks. 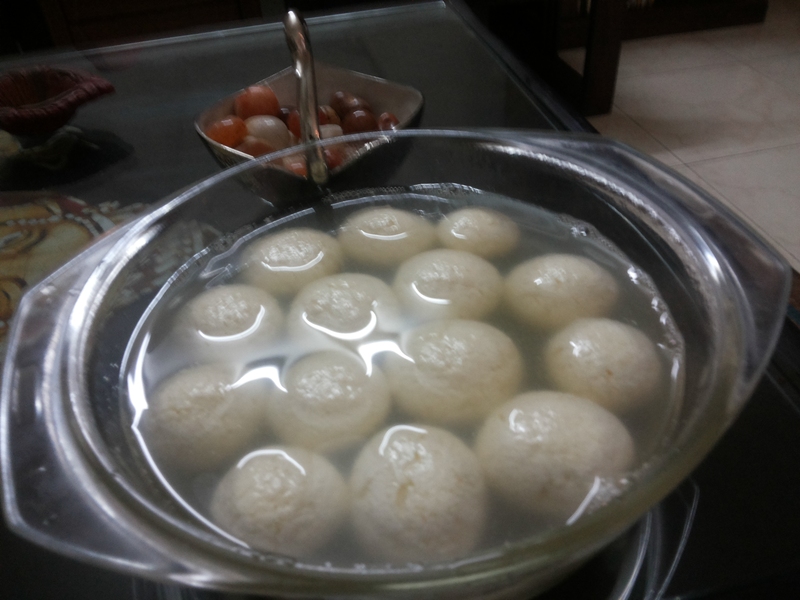 In a pressure cooker take water (sufficient to cover the Rasagullas) and mix the suga and Elaichi in it. Add the chenna balls and pressure cook for 1 whistle in a medium flame. And then 5 min in low flame and switch off the gas.. Once the pressure drops completely, open the pressure cooker. You may add few drops of rose water.